New2 is an Australian artist known as one of the first graffiti writers to emerge from the Australian train writing scene in the early 80s. He is also one of the artists who founded the DMA crew (short for Da Mad Artists), a group that shortly became very prominent on the Australian graffiti scene, and that is active and successful to this day. Although New2 still writes on walls, over the years he started exploring other areas of his artistic expression, namely collage, wooden sculptures and ceramics. The recent works of the Australian artist include elaborated, hand-cut paper collages, where he manages to recreate his writings on streets and trains from his fruitful 30-year-long career. New2 merges the two different aspects of artistic creation: the experience and simultaneously possessing the old and new. His futuristic lettering delves into the diametrically different notions such as belief and fact, religion and science, drawing from both ends of the spectrum. He juxtaposes these opposite outlooks on the same event. 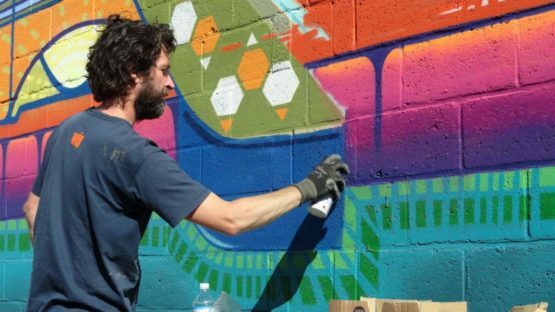 New2 is one of the first Australian graffiti artists to gain an international renown. Highly acclaimed, his works have been exhibited throughout Australia, Europe and the United States, featuring in both one-man and group shows. The most notable solo exhibition, titled In One Hand a Ghost, the Other an Atom, took place in December 2012, and was opened for the public until January 2013 at White Walls Gallery. In 2014, New2’s works were featured in the Transit group exhibition at Vertical Gallery in Chicago, along with the artworks of artists such as Cope2, Nick Fury, Jonathan Michael Johnson, and many others. New2 currently lives and creates in Belgium.